It's the classic story of a boy and his pet frog. 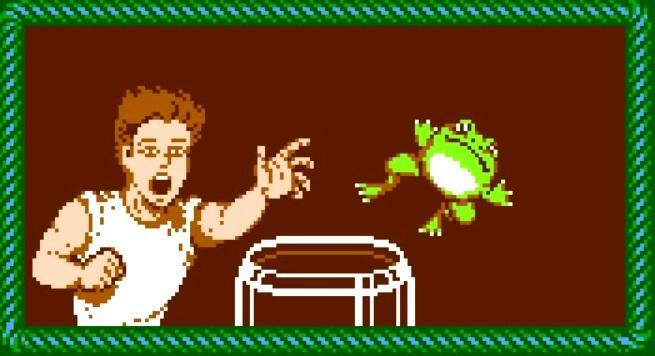 Here's a quick shout out to one of the most overlooked and groundbreaking games on the original NES, Blaster Master. I never thought it would pop up on the Virtual Console again, but here it is in the digital flesh: Sunsoft's Blaster Master is available for just $4.99 from this week. He finds the most technologically advanced tank in existence, specifically designed to battle mutant monsters. Using his sweet new ride, Jason charges forward into the sunlight after his wayward amphibian friend. It's an opening sequence of epic proportions, made better by Sunsoft's unparalleled NES soundtrack. Seriously, those guys were the Mozart of chip tunes. Whatever happened to them, I don't know. Sunsoft just sort of vanished after the NES days. Blaster Master is home to a ridiculous amount of layers. Jason's SOPHIA THE THIRD tank sees the lion's share of the game's action, and he drives her around each sprawling stage as he would in a modern day "metroidvania" game. Lots of branching paths, secret catacombs, and power-ups are just waiting to be uncovered. Often times, Jason can leave the safety of his vehicle and take to hard to reach areas on foot, giving him an extra moveset that his tank is incapable of. However, when sprinting on his own two feet, Jason is much more vulnerable and is likely to get swatted by a radioactive bug if he's not careful. Two distinct movesets aren't enough for the enormous ambition of Blaster Master though, so Jason can also enter caves tucked away in the confines of each level. Each of these transports him into a Legend of Zelda-esque overhead dungeon where he can explore and dig up items and power-ups. More often than not, this is where he also finds the game's relentless boss battles. Seriously, if Dark Souls II is the most challenging game you have notched on your gaming belt, Blaster Master is a perfect window into the brutal kinds of games NES owners had to suffer through during its heyday. This game will eat you alive! Great music, great gameplay, great challenge, great price. I can't think of many other games that deserve a Virtual Console release than this wonderful little gem, and I recommend that you give it a try if you are up for the challenge. I know what I'm doing on my long train rides to work this week.